I love amateur astronomy, I really do, but there is an element of frustration that rears its ugly head after traipsing off to find some dark skies – it’s time to align the telescope – Ugh! I know many purists believe that the alignment task is a rite of passage for the serious amateur, but for me it’s an annoyance that should be easily solved with technology. Enter the new Meade LightSwitch technology. Two new scopes from Meade Instruments Corp., the LS-8 ACF and the LS-8 SC come with a feature that is long overdue. To align the scope you just flip a switch and the scope automatically aligns itself in the night sky. Built-in GPS, magnetic north sensors, level sensors and a CCD camera does all the work. Within minutes of powering on, you’re ready to start observing. This is what I’ve been waiting for a very long time. The two scope models built around this exciting new technology offer a choice of optics. The LS-8 SC uses Meade’s high-performance Schmidt-Cassegrain optics, while the LS-8 ACF uses Advanced Coma-Free (tm) optical system. In addition to the 8-inch aperture scopes, Meade also offers 6-inch versions, LS-6 SC and LS-6 ACF. Pricing for these new products is steeper than previous models, but remember you’re getting a built-in CCD camera, and of course – LightSwitch technology. Considering this, I think the scopes are fairly priced. 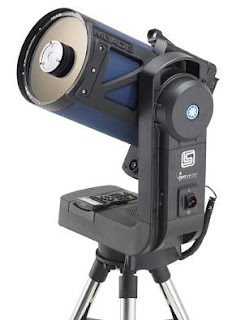 So if you’re considering updating your amateur astronomy footprint, you need to consider these amazing new products from Meade. This one is at the top of my shopping list. Happy stargazing!